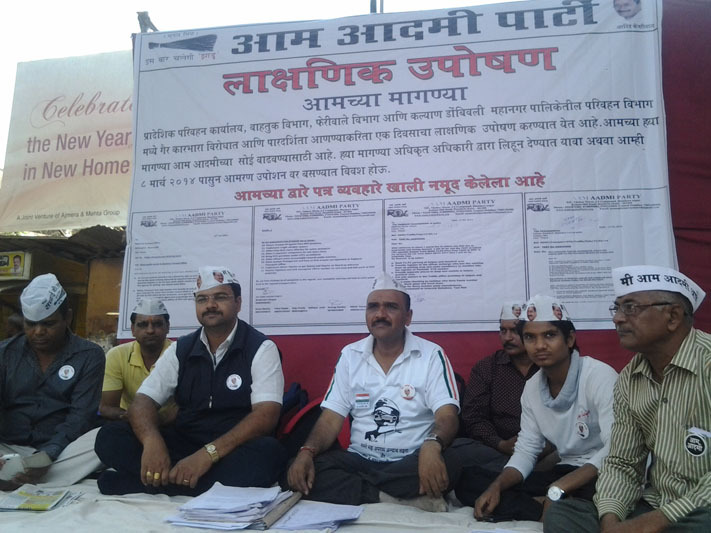 Aam aadmi Party Kalyan Dombivali organized 1 day warning “Token Hunger Strike “against irregularities at RTO kalyan and Kalyan Dombivali Municipal Corporation . After no response from RTO Kalyan and KDMC , Aam aadmi Party activists Shailendra Bhagat, Vaibhav satav, Anil Joshi, Dr. Raju Ram, D Upadhaya and Devendra Sharma done 1 day token hunger strike . Aam aadmi Party Kalyan dombivali made demand to RTO kalyan Mr Gujarati, (Head RTO Kalyan) to make RTO premises "Agent free zone", not to harass citizens who submit form directly to RTO officers making nominal error. Due to harassment, public have numerous roundup at RTO kalyan. They also demand for single window clearance, citizen charter implementation, CCTV surveillance and Vigilance department details board for public. They also demanded parking area P1,P2 at Kalyan Dombivali , provide register to the officer in charge who tow the vehicles from no parking area and make mandatory to maintain the register on daily basis. They demanded separate places to keep tow vehicles , CCTV surveillance of traffic police premises. Action Against Fancy number plate, black glass and makers of fancy number plate also demanded by Aam aadmi Party . They also demand not to harass innocent auto rickshaw on road. Demand from KDMC commissioner SS Bhise to investigate Bus purchase scam , advertisement rights to bus shelter scam , irregularities in sale of 56 old buses scam tender, fitness problem of latest purchased buses from Tata and Ashok Leyland under JNNURM scheme. They also demanded provident fund and medical facility for KDMC workers as per law. They also demanded hawkers registration and provide them pension scheme for their safe future. Major demand is to appoint independent committee to investigate KDMC scams of various departments.